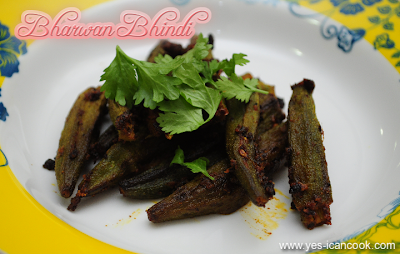 Bharwan Bhindi is a very simple and easy to prepare recipe. 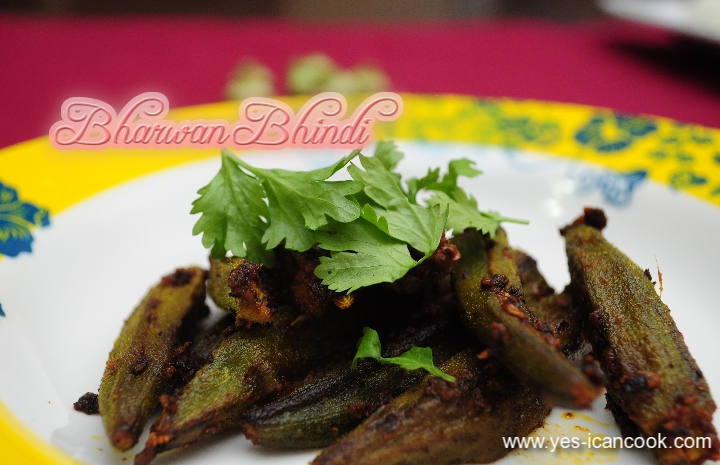 Bharwan means Stuffed and Bhindi means Okra or Lady's finger in Hindi. This recipe is prepared by stir frying slit okra stuffed with spices. Both I and my husband loved the taste of Bharwan Bhindi. 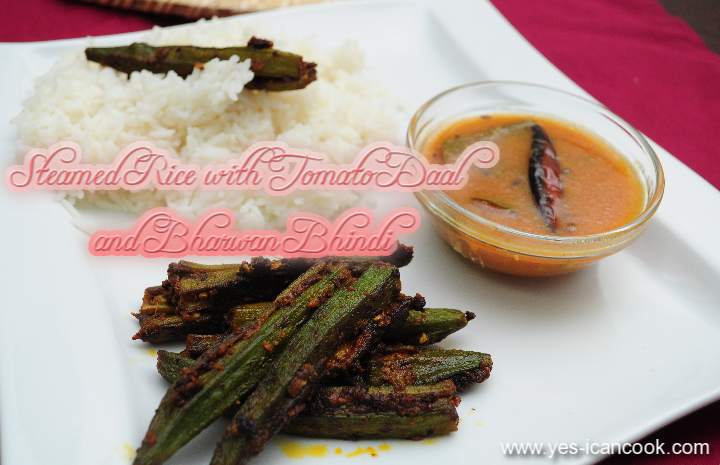 I prepared it as a side dish / accompaniment to Steamed rice with Tomato Daal. 1. Wash and pat dry the okra. Cut and discard the top and tail bits. 2. 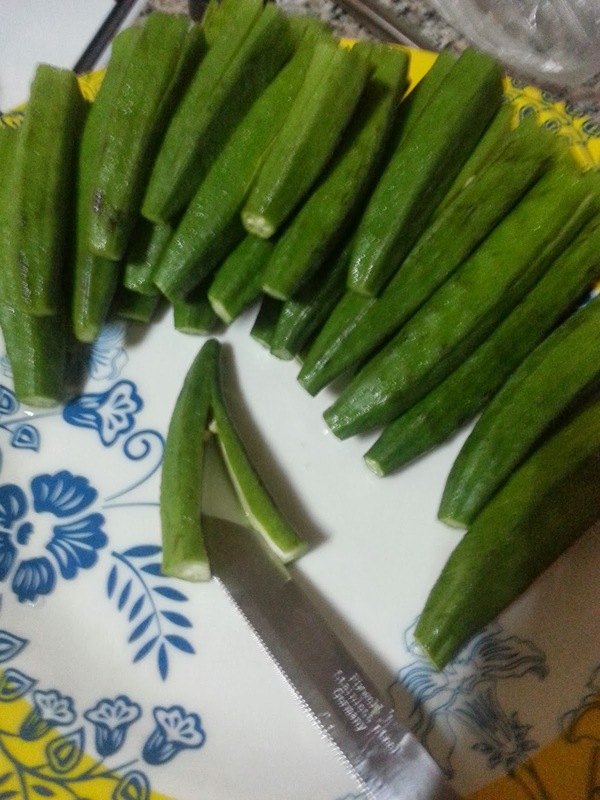 Slit the okra lengthwise making sure not to cut it into two. 3. In a small mixing bowl add ginger garlic paste, red chilli powder, turmeric powder, coriander powder, asafoetida, salt to taste, amchur powder, fennel seeds, fenugreek seeds, coriander leaves and mix well to combine. 4. Stuff this mixture into the slit okra dividing equally among all the okra. Keep it aside. 5. In a cooking pan add 2 Teaspoons of oil. 6. Place the okra in the pan and stir fry over medium heat. 7. Add the lemon juice in 3 additions of 1 Teaspoon each. 8. 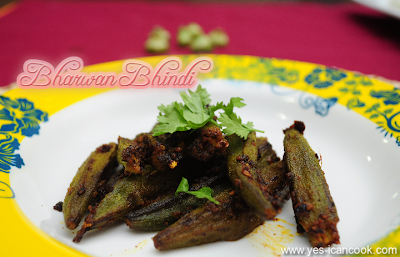 Spray oil as required and turn the okra from side to side and stir fry till the okra is cooked. 9. It should retain some of its green color. The masala mixture will turn brown but make sure it doesn't turn black as it will then start to taste bitter. Thank u Sara for the recipe. I am going to try this recipe tomorrow. My wife will going to try your recipe for my kids, because my kids really liked eating vegetables. I wish we could find more recipes from you. Thanks! I hope your family enjoys the recipe Jonathan.